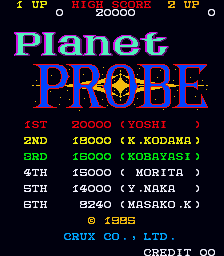 As promised, here is the 2nd part of the Planet Probe update. I’m not going to repeat details mentioned in the first update, instead I’ll simply mention that the tile flipping has been fixed, and priorities adjusted slightly based on what seems logical. A few sprite-sprite priority issues remain where the crosshair goes behind certain targets, but I believe these are part of the original game; multi-pass sprite drawing is exceptionally uncommon. I left the name entry screen to time-out after entering my initials so that people can hear the brief tune played there. The game doesn’t appear to have an ending, if you turn on the invulnerability dipswitch it loops the same few backgrounds etc. which means it plays a lot more like an ‘old skool’ shooter than anything else. *edit2* since recording these videos I’ve decided to swap the priorities around a bit, the glitches are just too obvious in the 2nd video the way things were IMHO. That’s kind of interesting. It’s like a side scrolling mashup of Galaxian and Xevious. I’m glad it finally surfaced. This must be the perfect MAME success story (or epic tale)! The game so rare almost nobody remembered it. The generous, spontaneous will of sharing of the collector. The suspence about the old data status. The team work, driven by experience and passion. I never dreamt MAME could preserve so much and with so much attention in details both technical and historical. It’s so good to find out, for example, that there are real links between Sky Lancer, Vastar and Planet Probe, games which I felt somehow connected in terms of design taste. Enough babbling ^_^ I’ll happily wait for this forgotten gem to shine on MAME! Are there any hidden text strings, or logos in the tileset? were Italian arcade distributors particularly big (covering the rest of Europe as well) or it’s just a matter of specific links between some Italian distributors and some Japanese companies? I think arcade games were just popular in Italy (popular enough for Nicola to start MAME..) so it was seen as a good location for testing. also I’ve decided, I’m probably drawing ALL the sprites in the wrong order, after studying things more carefully it appears the target should go behind things you can’t kill with it, but in front of things you can, right now it’s reversed. I’ll have to see how Vastar likes that, but I imagine it’s just another one of those ‘lack of evidence resulted in imperfect emulation nobody noticed’ cases. Re Italy: arcade games used to be very popular in Italy during the 80’s and early 90’s (when new stuff like holographic games started to appear) and gambling was prettty cheap. No comparison to where I come from where arcade games were more dubious, usually only available togehter with tons of fruit machines and ridiculously expensive. This changed in the meanwhile, many places put up fruit machines and similar stuff, most of the original arcade machines are gone now. NB: I’m not an Italian but I spent enough time there to see things myself and how they developed. Yes, in that time period in Italy arcade cabinets were everywhere, from pubs to beach bars. Most towns had at least an arcade room, while most sea towns had 3-4 of them. When the games became too expensive and impossible to bootleg (thanks in large part to the huge dedicated cabinets needed to enjoy most 3-D games), most arcade rooms closed. In the town were I live we went from 3 arcade rooms to none and almost every pub has gambling machines instead of arcade cabinets, now. http://mamedev.emulab.it/haze/ume/ume147u2_special.7z is a 32-bit command-line build of ume (mame+mess) using the current code. a video demonstrating the other highscore tune is now up, and the post has been updated. That’s incredible, you really nailed the song after 20 years!!! The differences are negligible. You guys never stop amazing me. If Karma was a real thing, you guys would be diving in money with beautiful women (at least the ones who like it), just like rock stars. Hey, I really like this ume thing. I saw your posts about it before but thort it was just mame and mess zipped as one download but after getting it for planet probe I can see it is just one mega mame program instead! I cant understand why the mame and mess dev team don’t give this version instead, so much better, all in one!! Ahh, thank you all, I’m flattered and amused – and special thanks to Haze who took the time to record the 2nd video with the “loser’s theme” tune. About what Etabeta says, it’s really “a matter of specific links between some Italian distributors and some Japanese companies”. There’s a quite rare Italian book called “Avoid Missing Ball” by Marco Cerigioni which has some funny stories about that. We did not have NES until late ’87, but we had plenty of arcades (like Osso and Fast Eddie recall) with crazy japanese boards everywhere. Stuff like Momoko 120% or Kiki Kaikai was *common*. Elmac, the dealer which brought Planet Probe to Italy, was vital in this process. But now… ume147u2_special. Very special, indeed! Gulp! … Bombing Elliott and E.T is priceless as it used to be. I’m a happy child now! I’m guessing tourism also played a factor. I’m from Belgium myself and arcades were pretty common in the 80’s/90’s – especially sea side resorts, and the yearly town carnival. The remark above that Italian arcades were dying as bootlegs became harder made me lol – I’ve seen some bootlegs in my days but were they really that common? Not that bootlegs always wore their bootlegness on their sleeve. Well, it was more of a concomitance of different causes (more powerful consoles, i.e. ), but bootlegs and bootleggers were indeed very abundant in Italy. Bootlegs? Well, I needed to go to England on holiday to see a proper Bubble Bobble coin-op, for instance. In Italy the game was everywhere, but with the “Bobble Bobble” bootleg name. (One not uncommon bootleg, “Bobble Bobble – The New Datsu 50” has not been found/dumped yet AFAIK). I was used to see the “if you are playing this game outside Japan you’re involved in a crime” splash screen. This at least, was the situation in the North-East of Italy (which is where Planet Probe was found, BTW), at least. So on the subject of the copyright.. There is room in the ROM after the year string for a copyright message, however it is filled with the ‘string termination’ character rather than a string. the start position 2 lines down / 3 left of the (c) symbol is the same as Gyrodine with it’s CRUX copyright. however, there is room for more characters, you could even fit the alleged ‘try corporation’ there, but it’s a bit off center, which makes me think they probably simply never put anything there..
doesn’t really prove anything either way, other than there is code to draw a (blue) string there. Bootlegs ? Reminds me of Splatter House… “If you are playing this game outside Japan… yada yada yada”. Who cared anyway ? And I doubt that there was any original Double Dragon machine down there in the heydays of the game. UME is the new name for Ultimate MamE? and it still plays my nes and sega games? Yes, UME is the same thing as Ultimate Mame, although it now stands for ‘Universal Machine Emulator’ rather than ‘Ultimate MamE’ as you put it. I thought this was clear from the description I’ve put up with each release, that it’s a combination of MAME / MESS, or is it not obvious that when I say it includes MESS I mean it supports all the consoles etc? That’s what MESS is, a computer / console / everything else emulator based on MAME, so when I combine them you do get your NES, SNES, Genesis, Master System etc. etc. 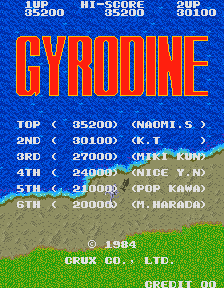 alongside your arcade titles in the main build. As for being the main build, I would still like to see that myself, as I’ve stated numerous times. The arcade-only version could be released under a ‘classic MAME’ moniker, but that it out of my hands. The source releases *are* complete these days, which is good, because a single source release now does represent everything the team(s) know. The actual teams / development tree did merge recently and that’s all going well, so I guess there’s still some hope it might happen eventually. It would IMHO at this point make more sense, streamlining the initial release process, increasing exposure to the MESS side of things, furthermore I think some of the people who were against it might now be wondering if it’s really such a bad idea after seeing how smoothly the basic merging of the teams / development tree has gone. As I said tho, it’s out of my hands, *I* personally can’t make that happen tho so for the time being just enjoy UME. Welcome to the world of advertising! You can never predict how people find out about something. All you can know is that you must be persistent in your efforts over a long period of time (at least a year). Most likely UME hasn’t yet reached a small fraction of its long-term audience. This interview, recently re-posted by Kold666 on Mameitalia forums, reminds us how messy is the whole Orca-Crux-Toaplan story. so, Maybe it is ture, it was one of rarest game ever devloped by toaplan. the another was prototype/location test version of snow brothers 2, Genkai Chousen Distopia, Survival Battle Dynamic Trial 7.